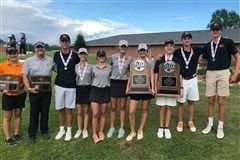 The Boys' Golf team finished the season as state runner up. Julian Maxwell was the individual state runner up, and Edward Hull finished in 6th place. Congratulations to Head Coach Virgil Herring, Assistant Coach Pat Sellers, and all the Tigers on an outstanding season. At the end of day one, the Boys' Golf team was in third place and trailed the leaders by 5 shots. The travel team consisted of Tallent Brown, Grant Hollomon, Edward Hull, Bo Maradik, Julian Maxwell, and Toby Wilt. The team will tee off Tuesday morning to compete in the second round.